Because of its high thermal performance, polyiso is the product of choice for energy-aware building owners, installers and architects. 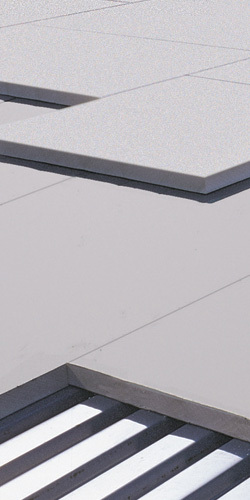 Polyiso is one of the most cost-effective and energy efficient insulation products. The U.S. Environmental Protection Agency has recognized polyiso for its responsible, minimal impact on the environment. Atlas recognizes governmental laws and regulations as a first necessary step toward environmental responsibility. Atlas values environmental leadership inside and outside the company, including participation in industry organizations. Atlas understands that durability and product lifespan are keys to sustainable building practice. Atlas understands that the total environmental impact of its products includes transportation and fossil fuel consumption. Atlas is committed to promoting and maintaining safety equipment and training programs for its employees. Atlas understands the need to conserve energy and raw materials used and incorporates recycled materials whenever practicable and consistent with required levels of quality. The company is committed to minimizing the release of waste materials and researching the impact that new facilities, equipment changes, or product development might have on the environment. 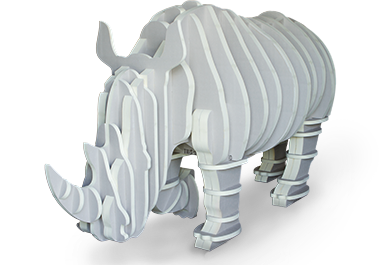 Atlas is committed to making its customers fully aware of the environmental benefits of Atlas products. In this age of rapid technological change, Atlas understands the need to remain current in environmental issues and in seeking to produce environmentally friendly products. The ASHRAE (The American Society of Heating, Refrigerating and Air-Conditioning Engineers) code has multiple compliance paths – from the simple, prescriptive compliance approach (checklist) to complex building energy simulations (performance-based compliance). When the prescriptive levels change (efficiency levels are increased), a new bar is also established for those seeking to use the more complicated energy simulation tools. The changes are climate zone and building type specific. Many states still recognize and use ASHRAE Standard 90.1-2004 which has been the energy code referenced in the International Building Code (IBC) and the International Energy Conservation Code (IECC). As such, this standard defines code minimums for the classes of constructions covered. 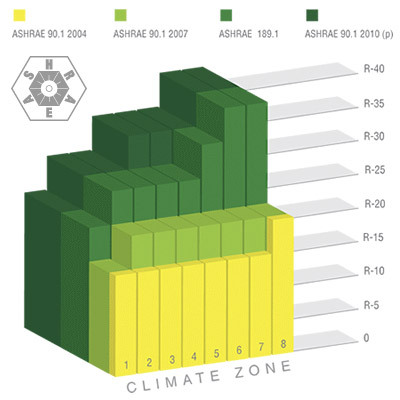 In 2007, for the first time in over 19 years, ASHRAE increased the minimum required prescriptive R-value (resistance to heat flow) for roof and wall insulation levels in Standard 90.1– the national model energy code for commercial buildings. The above-deck roof insulation requirements, previously at R-15, increased by 33% to R-20 in every climate zone in the U.S. Similar increases were approved for walls. The increased roof and wall insulation values apply to all commercial and high-rise residential buildings covered by Standard 90.1. These changes now become a part of the newest edition of the Standard — 90.1-2007. The International Energy Conservation Code (IECC) is being adopted rapidly by state and local code jurisdictions across the United States. The IECC incorporates the ASHRAE 90.1-2007 standard, offering both prescriptive and performance-based approaches. The newly approved ASHRAE Standard 189.1 — 2009 became the first Standard for the Design of High-Performance Green Buildings Except Low-Rise Residential Buildings, providing minimum requirements for the design of sustainable buildings to balance environmental responsibility, resource efficiency, occupant comfort and wellbeing, and community sensitivity. ASHRAE Standard 189 uses the U.S. Green Building Council’s LEED Green Building Rating System as a key resource offering a baseline that will drive green building into mainstream building practices. The next standard of code compliance will be ASHRAE 90.1 – 2010. The requirements for commercial roofs with polyiso insulation are expected to range from R-20 in the southeast to R-35 in the far north. ASHRAE has set aggressive goals for improved energy conservation in the nation’s energy performance standard for commercial buildings – targeting a 30% improvement in efficiency for the 2010 version of the standard. To achieve a specific level of efficiency, building codes require a structure to meet certain R-values. 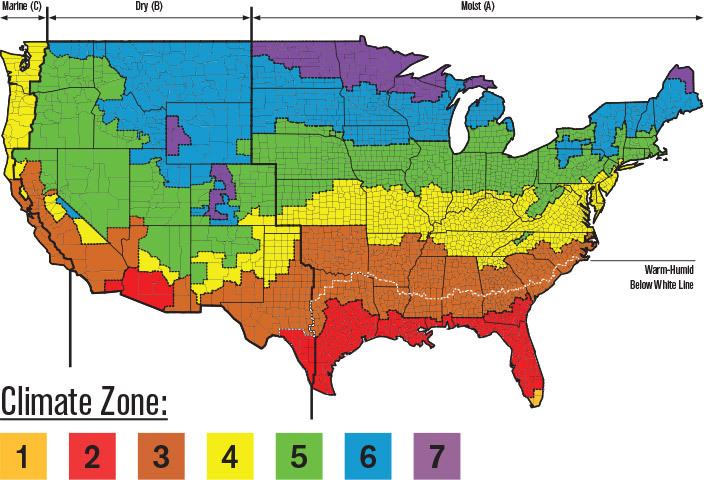 This minimum R-value differs depending on the region’s climate zone, and can vary to meet specific state and local building codes. 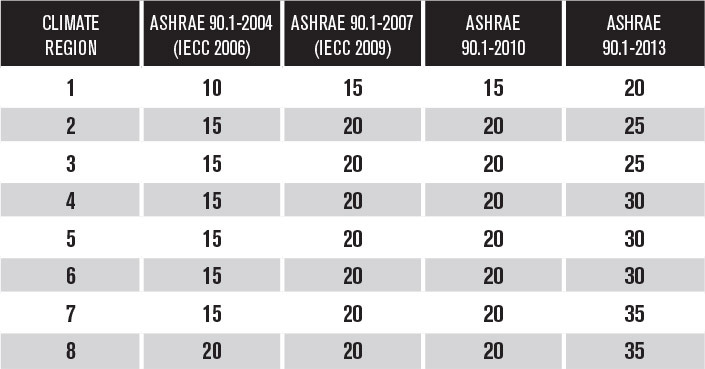 The chart below provides minimum R-value requirements for commercial buildings, residential buildings higher than three stories, and semi-conditioned buildings like warehouses for each ASHRAE zone. Zone 1 includes Hawaii, Guam, Puerto Rico and the Virgin Islands. Atlas is a proud member of the United States Green Building Council (USGBC), a leader in education, advocacy and advancement of the growing Green Building movement in the United States and around the world. USGBC was founded in 1993 and has grown to more than 15,000 members and more than 75 local chapters across the United States. Their creation and continued development of the Leadership in Energy & Environmental Design (LEED) Green Building Rating System™ has become an industry standard for educating and offering accreditation for Green Building projects across North America. LEED provides a complete framework for assessing building performance and meeting sustainability goals. LEED emphasizes state of the art strategies for sustainable site development, water savings, energy efficiency, materials selection and indoor environmental quality. Atlas insulation products can help earn LEED credits.